With a whole pack of extras and neat touches the Tiger Explorer XC has an extra rugged style. 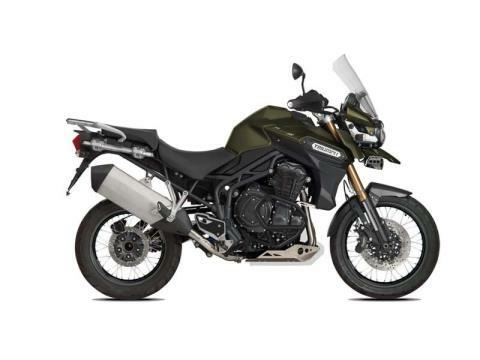 All its basics have been thoroughly proven on the Tiger Explorer. Like the 1,215 cc three-cylinder engine with its broad spread of torque, shaft drive, the long fuel range. Then there’s the class-leading handling and the genuine off-road ability. You still get the high levels of sophisticated rider aids too, like switchable ABS, traction control and cruise control. On top of all this, you get unique spoked wheels for added off-road capability and other equipment such as a sump guard, fog lights, and hand guards to add to your adventure. 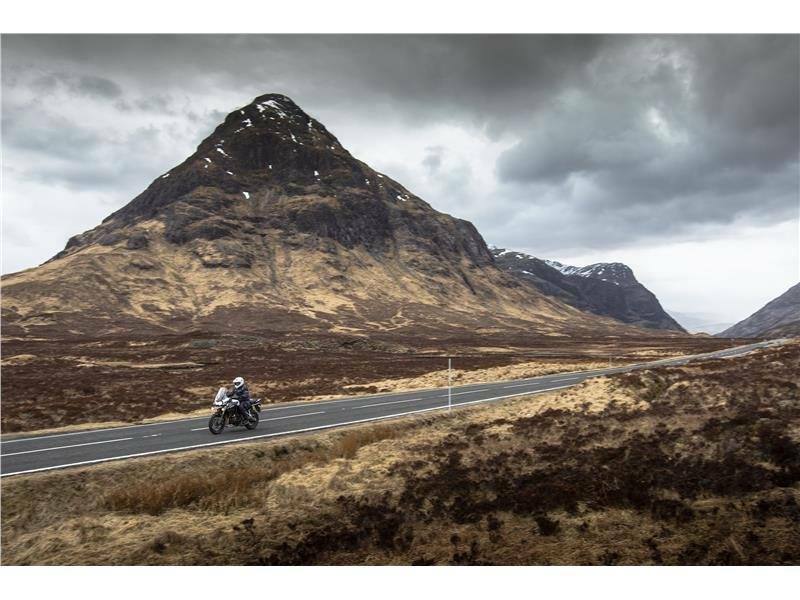 Frame: We built the tubular steel frame of the Tiger Explorer in the same style as other Triumphs. 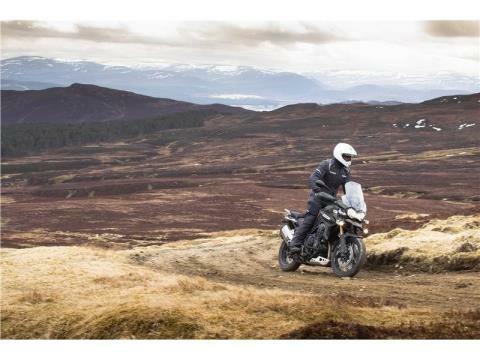 But it's made extra tough to deal with the stresses of off-road riding and on the road too, where you can load the Tiger Explorer heavily and still ride at high speeds or on badly maintained backroads in full control and comfort. Suspension: The suspension on the Tiger Explorer is built to cope with any kind of riding condition. We used tough 46 mm forks at the front with an extended 190 mm of travel, deal for rough roads and long distance comfort. And at the rear, the single shock provides 194 mm of travel and features a hydraulic remote preload adjuster and adjustable rebound damping. Brakes: Braking is looked after by a pair of 4-piston calipers and twin 305 mm discs at the front backed up by a single rear disc, all controlled by our advanced, switchable electronic ABS system. Wheels and Tires: The aluminum rim, wire-spoke wheels on the Tiger Explorer XC are lightweight and highly resilient, 17 inches diameter at the rear and 19 inches at the front, and come fitted with tubeless tires. Riding Position: The riding position is perfect. High, upright and dominant with wide bars and plenty of space. Even your passenger also gets plenty of space as well as large grab handles for their reassurance and safety. 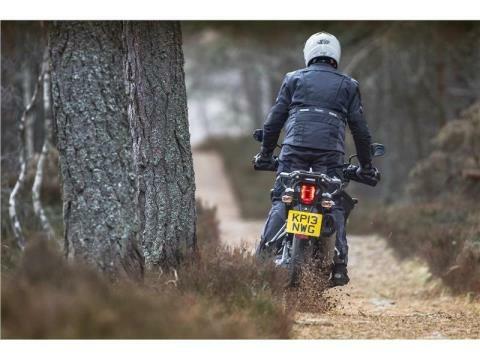 Handling: The Tiger Explorer is such an easy, natural handling bike. Be it low speed corners or fast sweepers, the Explorer shows outstanding handling manners. The wheelbase is long at 1,530 mm so you have plenty of room onboard and excellent stability. 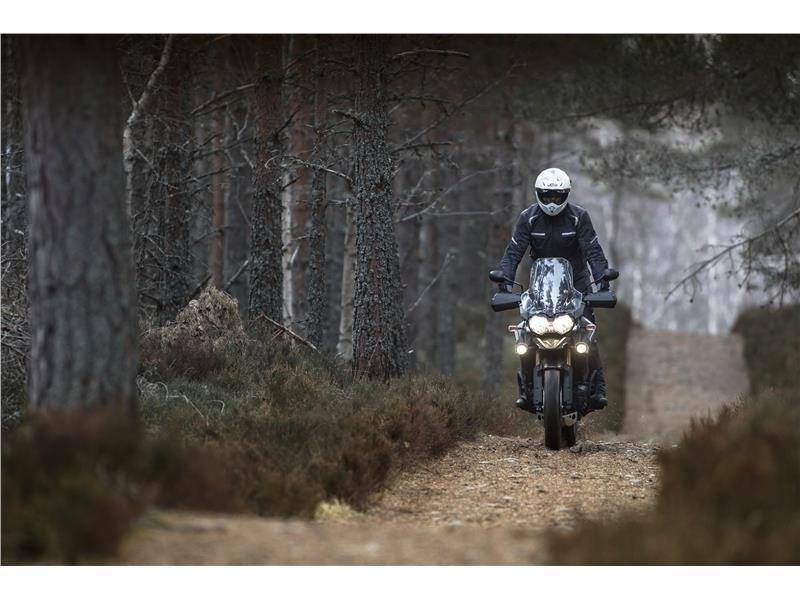 Performance: Like the Explorer, the Tiger Explorer XC gets our big, proven 1,215 cc 3-cylinder engine. Built with modern technology to be strong, dependable and have the low maintenance levels you need on long adventures. 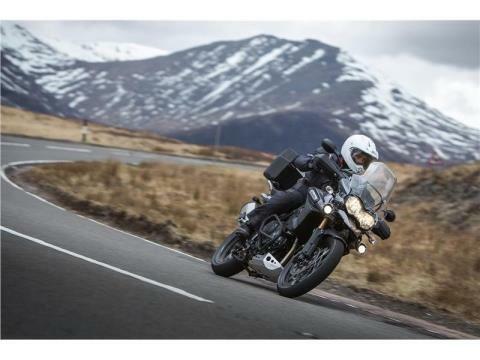 You can get plenty of torque and power from the Tiger Explorer XC, a hefty 137 PS and 121 Nm. And, not just that, its usable torque low down in the rev range where you need it. Double Overhead Cams: Double overhead camshafts operate the 4 valves per cylinder for an engine that does what it was made to do even when the bike is fully loaded with rider, passenger, a full complement of luggage and facing a steep mountain climb. Shaft Drive: We designed a rugged transmission comprising of a strong 6-speed gearbox and an exceptionally tough shaft final drive for the Tiger Explorer XC. This gives you smooth power delivery yet is capable of dealing with the shocks and knocks it can face off-road. And, it hardly needs any maintenance, so you can get on with your ride without worrying about it. Fuel Efficiency:	As a Triumph, the Tiger Explorer XC is highly efficient too, giving you 68 mpg at a steady 56 mph and, just as importantly, it comes complete with the engaging character and soundtrack you expect from a Triumph triple. 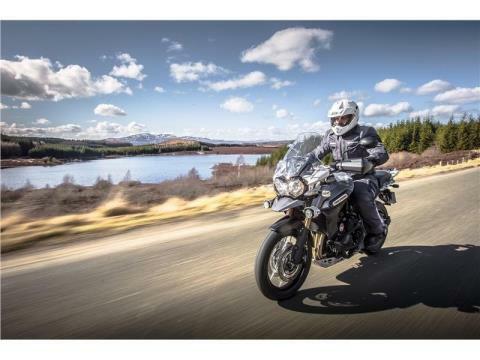 Ride-by-Wire: Designed to be as tough as the rest of the Tiger Explorer XC, the fuel injection is controlled by a Ride-by-Wire throttle system using computer control to give you the torque you need in the most efficient, predictable way. Sump Guard: The strong aluminum plate sump guard gives the bike extra protection off-road. Engine Protection Bars: The black engine protection bars give the bike extra protection off-road. Hand Guards: Hand guards protect you from branches while off-road and stones thrown up by cars on-road. And you’ll find their wind protection useful in cold conditions. Fog Lights: High performance 55W dual fog lights increase visibility for added security in poor riding conditions. Traction Control: The Tiger Explorer XC also comes with traction control as standard to give you added safety and confidence in slippery conditions. The system reassuringly keeps wheel slip to a manageable level by reading the speeds of both wheels, along with numerous engine parameters, and adjusts performance to assist the rider in maintaining a safe course. Cruise Control:	Cruise control is fitted to all Tiger Explorers, easing fatigue over long distances and optimizing fuel efficiency. Switchable ABS: The standard ABS system on the Tiger Explorer XC uses the latest technology to prevent wheel lock-up in any condition you find yourself in. And it can be switched off for off-road use, in case you want to lock a wheel up deliberately. 950W Alternator: As a serious all-weather rider you would expect to be able to use various electrical devices, so the electrical system is powered by a class-leading 950W alternator. Plenty of power for you to use on the optional heated grips, spotlights, and seats. Immobilizer: Just in case your Tiger Explorer XC attracts the wrong kind of attention, we’ve added a high technology security system. It detects a microchip in the key body and if it's not present the ignition system is disabled. This prevents a copy of the correct key being used to switch the bike on. Screen: Steady motorway speeds are made easy by the aerodynamically designed adjustable screen, which fends off the slipstream without creating undue turbulence or excessive wind noise. Instruments and Computer: The Tiger Explorer tells you everything you need to know on a journey. The LCD instruments use handlebar mounted thumb switches with up / down scroll facility and feature a comprehensive onboard computer including 2 trip meters displaying distance covered, journey time, average speed, average fuel consumption, instant fuel consumption, range to empty. Also visible on the LCD screen is the odometer readout, tire pressure monitoring system readout (if fitted), heated seat power indicator, cruise control operation information and service interval. There is also an on-screen alert for freezing temperatures as well as a numeric readout for ambient temperature. 12V Power Socket: We’ve added a 12V power socket close to the ignition switch for a GPS unit or heated clothing. Adjustable Seat Height: We made the seat broad, flat and easily adjustable to either 837 mm or 857 mm - no tools needed. So you can get comfortable whatever your size, while even the bars and levers adjust for finer tuned ergonomics. Payload: The Tiger Explorer XC’s payload is an incredible 222 kg. Ideal for those long adventures.